Combine all ingredients except lamb chops. Then add lamb chops and marinate for 2 hours. This entry was posted in Recipes and tagged lamb on November 11, 2018 by The Yellow Pine Times. Slow Roast Leg of Lamb – ultra easy, ultra tender meat to pull off the bone, served with a luscious gravy. Preheat oven to 170C/335F (standard) or 150C/300F (fan/convection). Place garlic, onion and rosemary in a metal roasting pan. Sprinkle generously with salt and pepper and rub it in. Drizzle lamb with olive oil. Pour broth and water around the lamb – it won’t cover it, that’s ok, the lamb sinks into it. Cover with foil (don’t use a lid, you want a bit of liquid to steam out). Remove from the oven, remove foil. Turn lamb over. Check it to ensure the meat is tender (pry a bit off with a fork). If not, return, covered, to oven. Return uncovered lamb to oven for a further 45 minutes or until well browned. Remove lamb, spoon over pan juices generously. Transfer to serving platter, cover loosely with foil while you make the gravy (stays warm for 1 – 1.5 hours). Use a large spoon to skim off some of the fat from the surface of the liquid. Place pan on the stove on medium high. When the liquid bubbles, add flour. Use a whisk to mix it in – this may take a few minutes as the liquid reduces. Once it looks like sludge (see video), whisk in 1/2 – 1 cup of water until it becomes a gravy consistency to your taste. Adjust salt and pepper to taste – I rarely add extra salt. Strain gravy into a bowl, pressing juices out of the onion etc. The meat is tender so you will only need tongs to tear the meat off. Serve with gravy. 1. 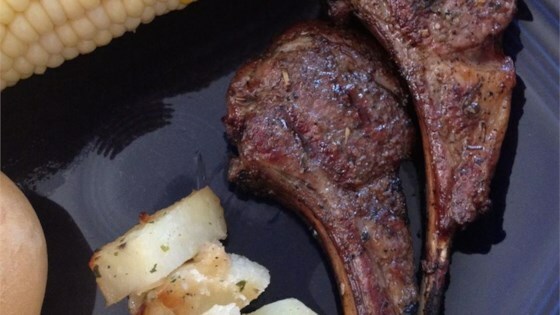 Lamb Cut: This recipe can be made with a leg or shoulder of lamb. Shoulder has more fat running through it than leg, so you can actually roast it uncovered (here’s my Slow Roasted Lamb Shoulder recipe), but this recipe will also work with shoulder. This recipe is designed for lamb leg because it’s leaner, so it benefits greatly from slow roasting partially submerged in liquid so it doesn’t dry out. Cooking it this way also infuses it with flavour. 2. The upper side of the lamb leg has more meat so we want to roast that partially submerged in the liquid for most of the cooking time. The upper side of the lamb is rounder and usually has more fat. The underside has less fat and is more flat. This entry was posted in Recipes and tagged lamb on April 29, 2018 by The Yellow Pine Times. Allow 1 pound per serving and add a little extra cooking time if the roast is boneless. Make slits in the meat and insert the slivers of garlic. Rub the surface of the lamb with the mustard and season generously with pepper. Place the lamb into a roasting pan and cook for 20 minutes. Reduce the oven temperature to 350 F and remove the pan from the oven. Add the potatoes and rutabaga around the lamb, and coat the vegetables with the pan drippings. Return the pan to the oven and roast for 50 to 70 minutes more (depending on the bone), or until a meat thermometer reads 145 F (medium rare), basting occasionally with the pan juices. This entry was posted in Recipes and tagged lamb on December 25, 2016 by The Yellow Pine Times. In a small bowl, combine honey, paprika, turmeric, cumin, cayenne, 1 teaspoon salt and 1 1/2 tablespoons olive oil, and mix well. Place cubed lamb in a large, re-sealable bag and pour in seasoning mixture. Seal bag, shake well, making sure to cover all sides of lamb cubes, and refrigerate for 2-3 hours. In a large Dutch oven or soup pot, heat remaining oil over medium-high heat and add onions. Season with salt and pepper. Cook until softened and translucent, 8-10 minutes, and remove from heat. Remove lamb from refrigerator and bring back to room temperature. In batches, place cubes in Dutch oven and brown on all sides. Return onions to pot and cook with lamb. Add dates, cinnamon stick, garlic, ginger, lemon zest and chicken broth. Bring to a boil. Reduce to a simmer, cover and cook for 15-20 minutes, or until lamb is cooked through and sauce has reduced. Prepare couscous according to packaging directions. Skim off excess surface fat, remove cinnamon stick, add toasted almonds and serve with couscous. This entry was posted in Recipes and tagged lamb on August 7, 2016 by The Yellow Pine Times. 2 racks of lamb (8 ribs and about 1 1/2lbs each rack) frenched (Ask the butcher to french them for you as it can take a bit of work) and cut in half with 3-4 bones per serving. Add bread crumbs, Parmesan cheese, garlic, parsley, mint, and rosemary to a blender or food processor and drizzle with 2 1/2 tablespoons oil. Process until the mixture is blended and uniform. Pour into a deep dish and set aside. Preheat the oven to 400F. Trim the lamb of all but a thin layer of fat, then score the fat with a paring knife in a criss-crossing pattern. Pat the lamb dry, then sprinkle with salt and pepper and pat the salt and pepper onto the lamb. Heat the remaining tablespoon of oil on a large, heavy skillet over medium-high heat until hot but not smoking. Brown the lamb 1 rack at a time, turning once. Cook until the outside is seared and browned, then transfer to a roasting pan, skin side down. Bake about 7-8 minutes. Remove the lamb from the oven and brush generously with Dijon mustard. Dip the lamb several times into the trust mixture, coating each rack completely and evenly. Allow the meat to rest 5 minutes. Place the lamb back into the oven for 4-5 minutes (or until desired doneness is reached. Use a meat thermometer inserted diagonally into the center. 130F will be medium rare). Transfer the lamb to a cutting board and let rest 5-10 minutes before serving. This entry was posted in Recipes and tagged lamb on February 7, 2016 by The Yellow Pine Times.